Infiniti software solutions, one of the worlds leading travel and aviation technology solution company has been certified by the International Air Transport Association (IATA) with NDC Level 3 capability as an I.T provider. Launched by IATA, NDC (New Distribution Capability) is an XML based data transmission standard which overcomes the challenges of the current distribution system for airlines. It will enable the airline to distribute its product offers and promote its ancillary services using rich content. 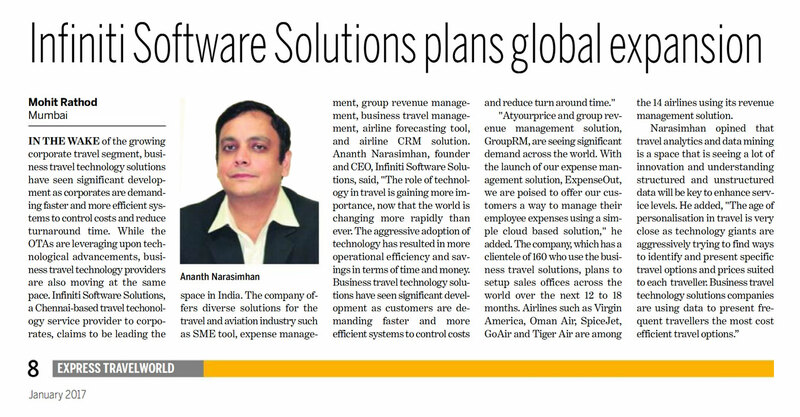 Infiniti software solutions, a Chennai based travel techonology service provider to corpo-rates, claims to be leading the space in India. The company offers diverse solutions for the travel and aviation industry such as SME tool, expense management, group revenue management, business travel management, airline forecasting tool, and airline CRM solution. Mr.Suresh Bethi as Senior Vice President - business travel. Infiniti software solutions, a leading travel and aviation technology company headquartered in Chennai India announced the appointment of Mr.Suresh Bethi as Senior Vice President - business travel. Suresh has over 30 years of experience in the travel industry and has worked with airlines and travel management companies. He will assume P&L responsibility for the business travel division at Infiniti. The business travel division currently services over 180 corporates across India with offices in Mumbai, New Delhi, Bangalore and Chennai. Infiniti's proprietary business travel solution Atyourprice.net has helped these companies increase operational efficiency and reduce T&E spend. "Suresh's vast experience in customer service, business travel operations, client engagement & retention, channel sales, institutional sales, vendor management and offshore management makes him a perfect fit for Infiniti", says Mr. Ananth Narasimhan. IATA awards Infiniti Software Solutions NDC Level 3 certification. Infiniti was honored to be the Travel & Expense Partner at India CFO Summit, Mumbai. Infiniti was Travel and Expense partner at GES 2015 event. Infiniti celebrated Advent 2015 - celebrating 10th anniversary. Atyourprice corporate new website launch.